We are pleased to announce the latest additions to our New England's Hidden Histories program. All three happen to be from churches that are now known by names that are different from the ones they chose when they were founded. Most people know the Third Church of Boston better as "Old South", either from the meetinghouse that is now a historical landmark or from the current home of the congregation in the Back Bay neighborhood. We have digitized some of their early records, which contain administrative information, as well as lists of members, marriages, and baptisms. One of the more prominent figures to appear in these records is Benjamin Franklin, who was baptized in 1706. Dating from when it was called the Congregational Church of Christ, the early records of this church span more than fifty years of church meetings, memberships, baptism and marriage records, and disciplinary matters. This single volume covers more than eighty years of church history from before it became the First Church of North Reading when the new town was established. Included are vital records of membership, baptisms, marriages, and disciplinary matters, as well as meeting minutes and the church's covenants. Join us for a concert by Renaissonics, accompanied by The Gropina Trio. 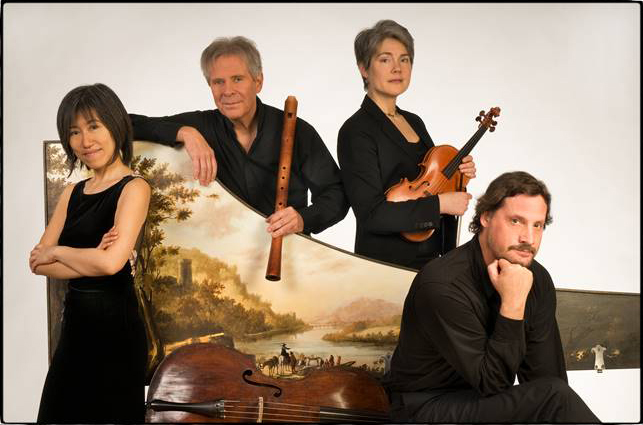 Renaissonics' newest program, Such Stuff As Dreams, is an enchanting voyage though the Renaissance imagination where the fantasies and genius of the age of Leonardo, Galileo and Shakespeare come alive through their music. Such Stuff As Dreams features Renaissance and early Baroque chamber music, dance music, and improvisations. Music from Shakespeare, elegant Italian madrigals and dances, early Baroque sonatas, English masque music, and of course Renaissonics' acclaimed improvisations. Renaissance music's expressive freedom derives partly from the music's being written completely without barlines. This allows each player the freedom to "speak" with their instruments like a storyteller; a true musical democracy where each voice is equal and free to tell their own individual story all the while intertwining with the other voices in a lush tapestry of sounds that are at once endlessly complex and stunningly beautiful. You can listen to samples of their music on their website. Our reading room will be closed to the public on Monday, December 5th for our board's quarterly meeting. As we approach the end of the year, we reflect on our blessings with our families and prepare for the upcoming holidays. Here at the Congregational Library & Archives, we hope that you will keep us in your thoughts, as well. 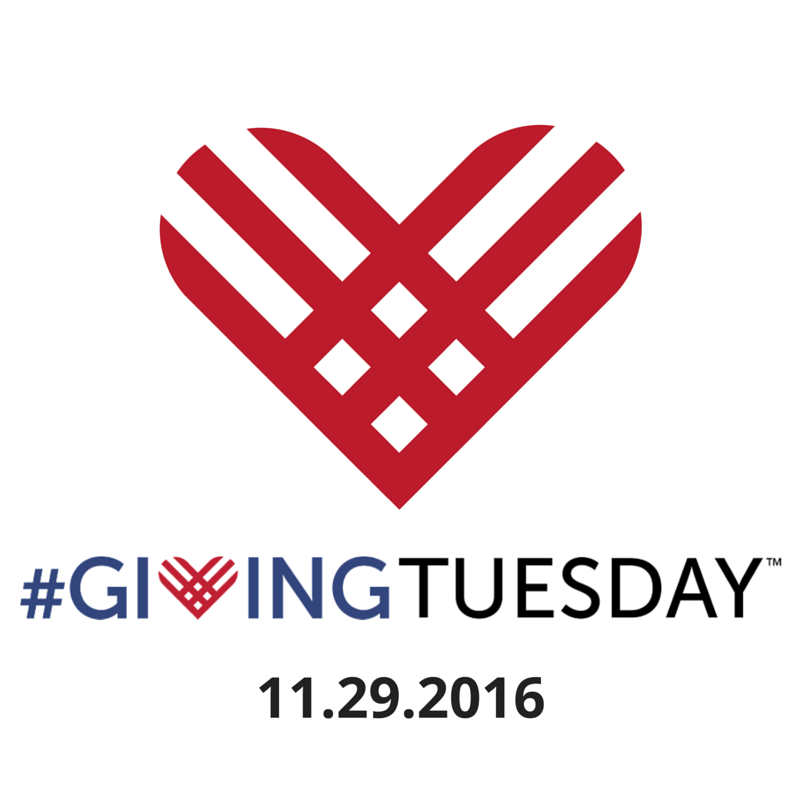 #GivingTuesday is a movement, built by people around the world, to celebrate giving of all kinds. It is celebrated on the Tuesday after Thanksgiving (in the U.S.), Black Friday and Cyber Monday; this year it falls on November 29, 2016. This movement is the result of the collective power of a unique blend of partners — nonprofits large and small; businesses and corporations; schools and universities; civic campaigns in cities, states and regions; and families and individuals — to inspire people to take collaborative action to improve their local communities and contribute in countless ways to the causes they believe in. Everyone has something to give. We encourage you to take the opportunity of Giving Tuesday to allocate your charitable giving, and we hope that you will make us a part of that. Our memberships are as little as $25 for students, and every donation is appreciated, no matter how small. Your support allows us to provide services to researchers of all backgrounds, care for rare and unique historical materials, and increase public access to information that might otherwise be hidden from the world. Help us tell the stories of early New England and its people. Help us preserve our past for future generations. Be a part of our ongoing mission to ensure that history matters. Whether you become a member or simply make a donation, we will put every contribution to good use. Whether you become a member or simply make a donation, we will put every contribution to good use. Mark your calendars and get ready to spread a little joy. The Congregational Library & Archives will be closed this coming Wednesday through Friday, November 23-25, in observance of Thanksgiving. All of our online resources will be available as usual. If you have a question you'd like to ask the staff, send an us email or leave a voicemail, and we'll get back to you when we return to the office on Monday, November 28th. The Congregational Library & Archives will be closed on Friday, November 11th, in observance of Veterans' Day. 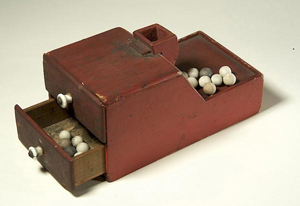 By the 1640s Massachusetts had already moved beyond paper ballots. Enter Mighill Smith. On May 26, 1647, the government voted to make Mr. Smith a freeman. That meant he had attained a coveted status in early New England. From the original handful of persons named in the Bay Company charter, the Puritan settlers quickly expanded the right to vote to include a much larger population, namely, all (male) church members. So Mr. Smith proudly joined the ranks of the freemen; and it appears he voted that very day in an election for the Colony's Assistants. It may have been the first time he ever voted in his entire life. It isn't clear that Mr. Smith believed in voting early and often — but he did drop three beans into the receptacle. A poll watcher caught him. He was accused of violating the October, 1643 law against voting more than once. As a result, in what may have been the first case of voter fraud on these shores, a £10 fine was levied on Mighill Smith. That hefty sum could have amounted to almost half of his yearly income. Justice was swift. In that same session of the Great and General Court, maybe even on the very next day, the Court reached a judicious and compassionate verdict. "For his puting in of three beanes at once for one mans election," says the record, "it being done in simplicity, & he being pore & of an harmles disposition," Mr. Smith's fine was suspended. Don't forget to let us know if you'll be joining us for tomorrow's free lunchtime lecture. Taciturn New Englander, avatar of small government, Amherst alumnus, Governor of Massachusetts, and President of the United States. Calvin Coolidge is remembered for being all of these things but less well known yet central to his identity was his Christian faith. 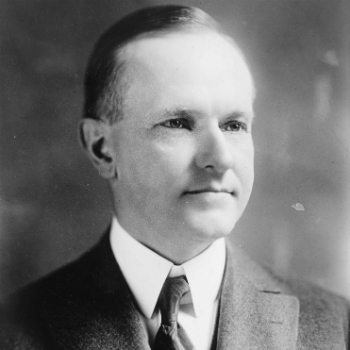 Coolidge was the only Congregationalist to serve as our nation's chief magistrate. 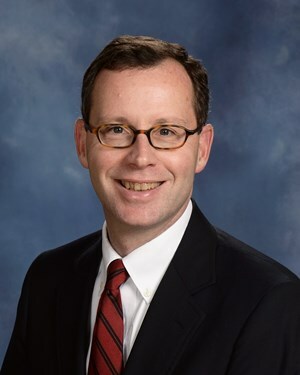 Come hear the fascinating, inspiring story of how his experience in the Congregational Church shaped his life from rural Vermont to the White House. This past Friday, October 21, 2016, the Congregational Library & Archives lost one of its greatest friends. Harold Worthley — known to many as simply "Hal" — died after a brief illness. He was 88 years old. Hal was director of the Congregational Library for nearly three decades, from 1977 to 2003. Many will remember him as the authoritative source on all things Congregational, a wry and gentle man with a deep knowledge of the tradition and an endless store of anecdotes and stories. Researchers came to know Hal as a friend, always generous with his time and ready to answer any and all questions, no matter how obscure or remote the subject area. We are all deeply grateful for his years of careful stewardship of the library's collection, ensuring its survival in spite of limited staffing and financial resources. A native of Brewer, Maine, Hal was ordained a Congregational minister in 1954, and served parishes in Maine, New Hampshire, and Massachusetts. Between 1963 and 1977, he taught at Wheaton College in Norton, where he was College Chaplain and Associate Professor of Religion. Hal's deepest passion was for history. A graduate of Boston University and Harvard Divinity School, where he received his Ph.D. in 1970, he also did postgraduate work at Northwestern University and Simmons College. Hal was, bar none, the world authority on New England church records. His Harvard doctoral thesis focused on deacons and ruling elders of the early Congregational churches of Massachusetts — but it was the appendix to the thesis (which he sometimes called a 700-page footnote) that became his legacy. Hal took upon himself the massive task of creating an inventory of all the Congregational church records in colonial Massachusetts, tracking them down in churches, historical societies, banks, attics, and basements in every corner of the state. Published in 1970, An Inventory of the Records of the Particular (Congregational) Churches of Massachusetts Gathered 1620-1805 lists by name every original record book, as well as the ministers and lay officers of each congregation. The Inventory became iconic among researchers of early New England history and religion, and remains so nearly a half century after its publication. Hal's work is foundational to the one of the CLA's most important projects, New England's Hidden Histories. In many ways we are continuing the project he began so long ago, retracing his steps to the last known sites of old church records, and then making them available to researchers anywhere by digitizing, transcribing, and placing them online. Dr. Worthley's love for Congregational history did not end when he retired in 2003. He and his wife Barbara set to work transcribing documents, beginning with the diaries of missionary Gideon Hawley. They became indispensable to the Hidden Histories project as well. Hal was still transcribing the records of the church in Barnstable, Massachusetts, in his hospital bed. Hal leaves his wife of 61 years, Barbara L. (Bent) Worthley, and his children: Susan L. Field of Cape Porpoise, ME; Laura M. Worthley and her husband, Andrew Lavash, of New Braunfels, TX; and David B. Worthley and his wife, Stephanie A. Worthley, of Norton, MA. He leaves five grandchildren: Jesse D. Field, Marshall D. Lavash, Morgan C. Lavash, Leah D. Worthley, and Nina B. Worthley. He was the brother of the late Bruce E. Worthley. A memorial service will be held on Saturday, November 5 at 2:00 PM, at the Trinitarian Congregational Church in Norton, MA. In lieu of flowers, Hal has requested that memorial gifts be sent to the Congregational Library & Archives, with a note that the gift supports New England's Hidden Histories.